Eleven years are a long time to ruminate over an event like 9/11. It’s not a daily thought for me, but it’s always there underneath the surface, ready to pop up at any mention of the attacks. It’s a date when everyone knows where they were on that day, and continues to define our political landscape. At the top of every list for a commander and chief is the task of keeping America safe. While creating new jobs, cutting spending and paying down our national debt are what this year’s presidential election is all about, those come after every avenue of preventing a terrorist attack has first been exhausted. These attacks remain visceral for those who were there and reported on them. When I pause for a moment and put myself back into my office in Washington, DC at 8:46 a.m. on 9/11 I can still feel it. The chaos that ensued. Not knowing if or when it was over. Could we go outside safely? Rumors were circulating that the State Department was a target. My wife was teaching a few blocks over at the George Washington University. Was she OK? Did she know what had happened? I distinctly recall sitting on the curb with my friend Peter Clavin out in front of our office at 20th and L Streets, NW. We just watched and listened to the sights and sounds that did not compute. Pandemonium in the streets of the nation’s capital – that was not supposed to happen. The Metro was shut down, forcing confused and frightened commuters to walk home to Maryland and Virginia. Fighter jets screamed over the streets of DC, and a smoke plume rose from across the Potomac where an airplane crashed into the Pentagon. A heightened state of alert was declared for residents and workers in Washington, DC. That is something you never want to hear. I lived on Capitol Hill, where am I going to go, everything in Washington is a potential target. To our country’s credit there have been no additional attacks on America, but it has come at a great cost, financially, and from loss of life and limb by our military troops. The war in Afghanistan continues, and has become the longest war in American history. We all owe a debt of gratitude to Presidents George W. Bush and Barack Obama, and to the members of the U.S. military and law enforcement personnel for our safety. One positive take away from 9/11 is it didn’t become the tipping point al-Qaeda intended it to be. Many leaders of al-Qaeda have been killed or brought to justice, and terrorist networks worldwide find operating in the heightened intelligence atmosphere of 2012 to be a dangerous proposition. Time has lessened some of the raw grief for much of the country, but doubtful that is true for families who lost loved ones or colleagues in the attacks. Police, firemen, paramedics, and medical personnel who dealt with 9/11 up close have been impacted for life. Part of this is the audacity that such a coordinated and destructive set of terrorist attacks was carried out against the United States on our soil. We knew this threat existed, but underestimated our enemies – we didn’t train properly for our fight and we got knocked out by a lesser opponent. 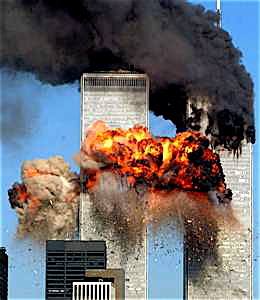 It was the ultimate upset to see the Twin Towers fall. It’s sad. America has become a more savvy member of the international community, more worldly, and appreciative of concerns voiced by smaller nations – but a great deal of our innocence was lost on 9/11. I remember that today. I say prayers to all those families who were impacted, and I mourn a simpler life we once knew, which is gone forever.